I wonder if the person who said that the road to hell is paved with good intentions thought a lack of intending to do right was a wiser option? I'm sure he was trying to make a point about those who mean to do things but never follow through, but dissing intention in the process is a bad move. I attend a yoga class where the instructor, at the beginning of class, encourages us to set a small intention for that day's practice. It can be anything, like focusing more on our breathing. We are going to breath anyway, right? Why focus on it? It is certainly something we do unintentionally every moment of our lives. 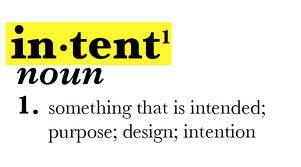 But focusing on it, doing it with intent, gives it power. Focus + intent = power. Power = work (for our purposes let's say strength) over time. But hey, this isn't a physics lesson. We often hear people say that they don't have time for things. They don't have time to read, or exercise, or spend time in prayer and meditation. Yet we all know incredibly busy people who do all these things amid their hectic schedules. How? Go back to the actual formula for power and notice it is work over time. Drawn out, kept at, committed to. Too often we let the day unfold without any real plan. We are driven by someone else's schedule. We are manipulated by the needs of others who often need help or find themselves in dire straits because of their own lack of intention. We become slaves to the urgency of right now. Oddly enough we can still find time to watch hours of banal television programming, "like" every silly meme on Facebook, or watch one cute animal video after another on Youtube. It is a fact of life that you will find time to do the things that are important to you. The problem may be that we haven't ever sat quietly someplace and thought about what those things are. Everyone says they want sound friendships, to be more informed, to have less stress. Let's back up. What do you intend to do about it? For years while I was home-schooling my children, along with all the other things that were on my daily to-do-list, there was an hour or two (depending on how busy the day was) devoted to reading. I read all the classics aloud to them, but also read a plethora of self help, biographies, and history. People often commented on the amount of books I read. How did I do it? I made it a priority, cordoned off the time, and guarded it carefully. I thought it was just as important for my children to have a well read mother as one who cooked and cleaned. My children and I remember those times as being among the happiest and most memorable parts of their childhoods. So my intentions had UNintended benefits. We generally hear the Law of Unintended Consequences used in reference to negatives. Just as often though, good things beget other good things. Things we may not have thought of and some we may forever be unaware of. Our best intentions and action plans may not always bring about the positive change we want and even with "the best laid plans" our road may take unexpected twists and turns we might not have foreseen and divert our energy and focus temporarily. But not having our intentions set is almost a guaranteed fail. Daffodils are blossoming all along roadsides and driveways most places in the south, have been for a couple of weeks. My bulbs are a little slow in coming up so I don't know if the bees are all over the neighbor's or not. I have a large camelia bush by the edge of the driveway, however, and on warm days it is abuzz with activity. Even the spent blossoms that have fallen to the ground attract bees. The interpretation of this verse is generally that the "wholesome teaching" is in step with a conservative political agenda. What if we're wrong about what the Bible's concept of ear tickling might be? We on the fundamentalist/conservative side of things think that it means accepting what we view as sinful lifestyles. We think it is preachers who focus on the positive instead of ranting about hell and the consequences of sin. We see the world changing in ways we don't like or understand (and that we aren't trying to understand) and worry that disaster is just around the corner for the Kingdom of Christ. But what if we've missed the real point? What if the thing that is tickling our ears is judgement and condemnation? What if the "easy" Gospel is one we've manipulated and twisted to mean being able to repress or oppress people based on their choices or weaknesses? What if our pride is fueled by "hating the sin" when we are without enough spiritual openness to "love the sinner?" What if the real thing that is "tickling our ears" is our thinking that we are right or have the answers instead of despising our own pride and hypocrisy. Let's face it, the hard thing to do is not formulate opinions and then find scripture to back up our thinking. The hard thing, the really painful thing that will crack open our hard hearts and allow the love of Christ to stream into our crusty spirits is love. Compassion. Kindness. Openness. Grace. Jude 1:18 They said to you, "In the last times there will be scoffers who will follow their own ungodly desires." What if the "ungodly desires" are not the things we normally think of? What if the ungodly desires in this passage refers to other things we know God hates: lack of compassion for the poor, violence, faith in a political system instead of God? When we hear these verses taught or discussed they are generally used in reference to things like homosexuality. I am always amused at how upsetting we find other people's sin. Psalm 139 says search me o God and know my heart. Me. My. Not his, hers, theirs. Mine. What if the tickling of the ears we should be worried about is anything other than the love of Christ, complete redemption, healing, and restoration for the broken around us. What if in our pride we have been deceived into thinking our mission is something other than that? I recently heard a well respected talk show host connect our possible redefinition of marriage and the country's "turning our back on God" to the Sandy Hook shooting and another well known pastor blame the TV show Glee for "destroying America." I find it interesting that these same men never blame the violence perpetrated in an unnecessary war for our country's problems. I cannot remember the last time I heard a rip roaring sermon about the evils of gluttony or conspicuous consumption. Why can't lack of forgiveness, bitterness, being unconcerned about poverty be the reasons for the nation's problems? What if our hypocrisy and not open hearts and minds, is the real problem? The ministry of Jesus was, and is, personal. It's about my heart and yours. It's about binding up the brokenhearted. It's about the poor. The lonely. The wounded. What if the message is being twisted by some churches? What if it's not the ones we think?